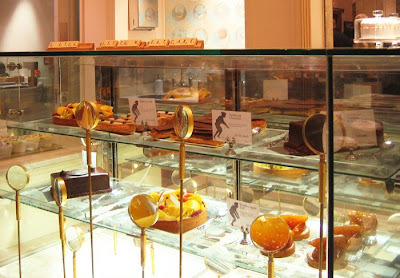 So after the sad visit to the site of the formerly fabulous New Piccadilly café, I consoled myself with a visit to the food hall in Fortnum & Mason. I have never had the chance to pop in a gawp at the goodies on display from fine teas, chocolates and preserves each costing approximately the price of a new lung - make no mistake this 'aint no place for your BOGOFs. I have been lucky enough to have had the pleasure of a F&M hamper, a kind Christmas gift from the OH's boss when he was a city boy, which in fact MADE my Christmas. I remember the scene of opening this hamper was like that bit in Pulp Fiction when he opens the case and his face was illuminated by gold. Three deli counter size whole cheeses, chutneys, crackers and wine which were so, so good. 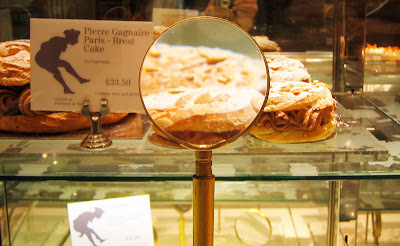 The patisserie counter was so pretty and if it didn't already tempt you enough, they have positioned magnifying glasses in front of the cakes! The breeze from the refrigeration unit made the gold leaf decoration on the chocolate slices almost dance (but I may have been delusional at this point, visually drunk on all the sensational foods.) A nice touch were the Scrabble letters on the counter top which spelled out "Let them eat cake", which is the best idea I've heard in ages. Drool.